Referral development is another important part of practice development. Your practice must have a strong referral base that consistently sends patients to your center. Patients who do not refer themselves directly to your center will rely on the recommendation of their primary care physician or family doctor when they need treatment. MedIngenuity has extensive referral development methodologies that merely involve us customizing your practice into these tools, which saves you an extensive amount of money. MedIngenuity recognizes that the future of healthcare for specialized urology centers is not one that is dominated by referrals from primary care doctors or family practice physicians. This trend of removing the "middleman" is caused by a new era of healthcare consumers. These consumers tend to do more research on their own via the internet and other sources. Consumers become more educated on the health issue they are facing, and they know exactly where they want to receive their treatment. 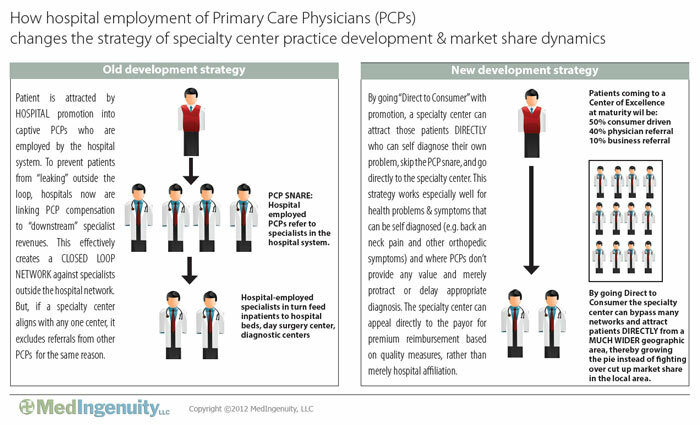 Healthcare consumers of the future will no longer spend their time and money going to a family practice physicians, but will instead refer themselves directly to the specialty center. So, is your urology clinic prepared to supply the demands of the new healthcare consumer? In order to be completely prepared, you must make an effort to be portrayed as an expert in your field by developing a professional, easy-to-use, and content-rich web site with plenty of educational content about medical issues your center can treat. This is very important because the new healthcare consumer will use the internet to research the issue they are having before they consult the expertise of a physician. Your website should be a one-stop-shop for consumers who want to research a medical issue as well as find a physician who is an expert in treating it.